Amaranthine Flowers By Design brings you this gorgeous bouquet. 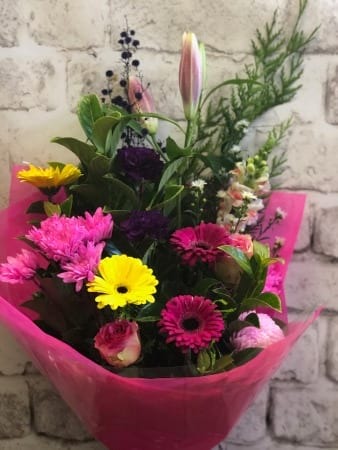 The Amanda Bouquet is a fresh design filled with seasonal blooms like pink oriental lillies, yellow gerbera, green chrysanthemum and lush green foliages delivered in a convenient temporary vase. Say I love you, Our thoughts are with you or Happy Birthday with this stylish bouquet in fabric wrap. Created by Amaranthine Flowers By Design, Charlestown Square, Newcastle. Same day delivery available, seven days a week, to all areas of Newcastle and Lake Macquarie, including John Hunter Hospital, Newcastle Private Hospital, Lake Macquarie Private Hospital, and Mater Hospital.